I’m super happy to call this piece done. It has been a work in progress for a long time and I was finally able to spend some time finishing it up over the past couple of weeks. 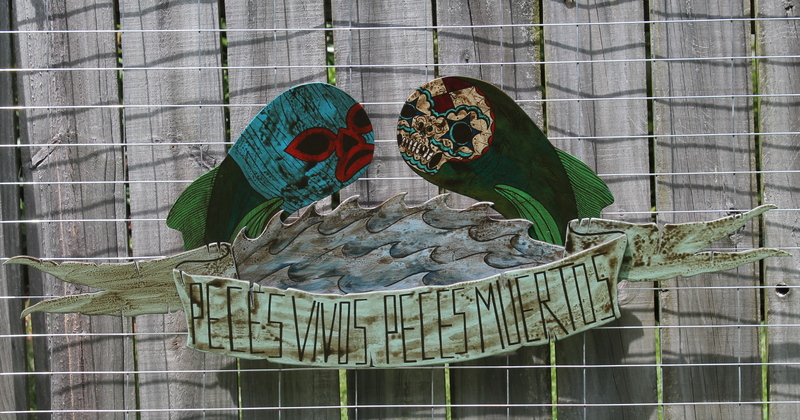 Live Fish, Dead Fish is an acrylic on wood painting of two fish. One wearing a Mexican wrestling mask and one resembling a Day of the Dead sugar skull. I’ve always loved the colors and imagery that represent these two traditions and particularly with Day of the Dead, I like the juxtaposition of ornate beauty with something as ugly as death. As for why I went with fish, this piece was originally intended to be part of a group show in conjunction with an annual fly fishing festival near my hometown. To create this piece, I sketched out my images on thin plywood and then used a coping saw to cut them out. After sanding everything down, I applied a wash of acrylics thinned with water to create layers of color. The detail work is done using fluid acrylics. Finally, I applied several coats of varnish to help bring out the brightness of the colors. As happy as I am with how it turned out, I also really enjoyed the process… even if it was a long one. Being a huge fan of Day of the Dead…I LOVE this! Thanks! I really appreciate the comment.